Wahey! Just got a fantastic review from Subba-Cultcha, you can read it by clicking here. Don’t write him off as a one-hit wonder. Guitar-based electro from straight outta the bedsit. I’ve always had a soft spot for bedsit artists. They owned the myspace revolution before there was one. When Jyoti Mishra hit the number one spot back when most people were worrying about whether it was cooler to like Damon or Liam, I cheered inwardly but, deep down, knew that it was a bit of a fluke. A decade later, and a whopping 6 years after he last troubled the record-buying public, he’s back – and this time, he’s grown up a bit. A more mature writing style and a stronger voice stand him in good stead – still recognizable, but with more depth, somehow. But where “Don’t Mention The War” really stands out is in the instrumentation. This is where the sabbatical has clearly been put to good use. 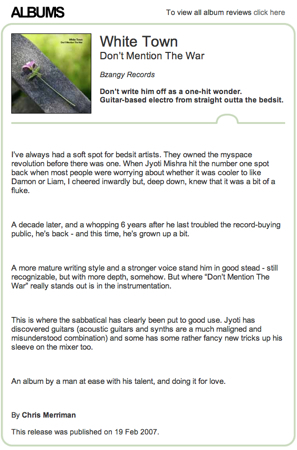 Jyoti has discovered guitars (acoustic guitars and synths are a much maligned and misunderstood combination) and some has some rather fancy new tricks up his sleeve on the mixer too. An album by a man at ease with his talent, and doing it for love. This release was published on 19 Feb 2007.